Norbert is a little pup (weighing in at 3 lbs and standing only 7″ tall to be exact!) with a huge heart. 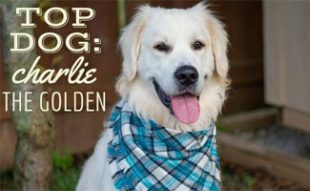 He was adopted into a loving home and now spreads the love around as a registered therapy dog, philanthropist and author of kid’s books. 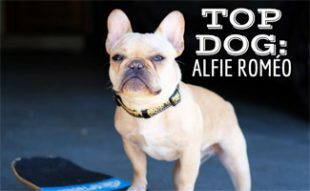 Read his story and all about this mixed breed pup’s amazing rise to fame. How did you and your human meet? Julie adopted me through a website called PetFinder. It was meant to be! When she saw my photo, she knew we were destined to be together. Julie and I were invited to be on Hallmark Channel’s Home & Family TV show. At the time, we lived in Carver, Massachusetts. We made the big trip out to sunny Los Angeles to appear on the show and talk about our work as a registered therapy animal team. 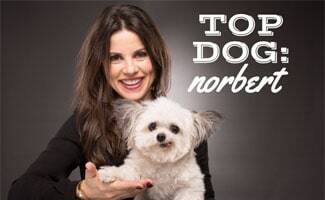 I remember one of the hosts of the show, Mark Steines, looked over at me and said, “Norbert, you would make a good wingman.” Well, he was right! Mark fell in love with my Mom, Julie. We flew back to Massachusetts, sold our house, and moved to Los Angeles six weeks later. I’m basically a fluffy cupid. 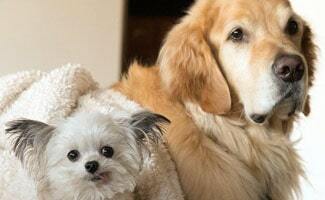 How and when did you become a therapy dog? 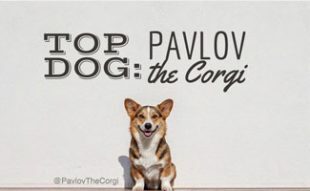 At the age of one, I passed the tests to become a registered therapy dog. This meant that Julie and I could volunteer together to bring comfort and joy to people in need at places like hospitals, nursing homes and other organizations. What are some of your small dog challenges? Welp, I don’t go up or down stairs! That’s OK though. I don’t mind getting a lift from one of my humans. Who are some of your friends? My fur-brother, Fred (pictured on the right) is of course one of my favs! He was in a movie called Spooky Buddies when he was just a pup. I’m also pals with Marnie and Tuna (read our interview with Tuna Melts my Heart). What’s your favorite toy and why? I only like one toy. Stinky socks. I don’t know why. They just call my name, and I must play with them until I’m pooped. I enjoy couch-time with my dad, playing with stinky socks, and taking photos to share on social media – another way I love to spread smiles. 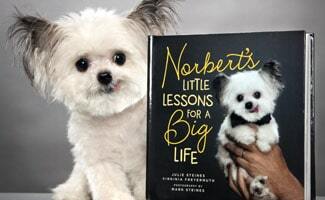 My fourth book, Norbert’s Little Lessons for a Big Life, was published on October 10, 2017. The biggest lesson I’ve learned is that you don’t have to be big to make a big difference in the world and that we can all make someone smile. Spreading smiles and more smiles is always on my mind. I am excited to come out with a calendar in 2019. I’m also working on a new AMAZING book. Lastly, I hope to be able to offer another Norbert Plush this year. My current plush has been sold out for a while and is in super-high demand. I am honored that so many people are excited to welcome me into their homes. I would like to thank the 1.6 million people on social media who are part of the Norberthood. I am so humbled and grateful to have the opportunity to spread smiles. I love reading comments, messages and mail from people around the world whom I have helped in some small way. It means a lot to me. 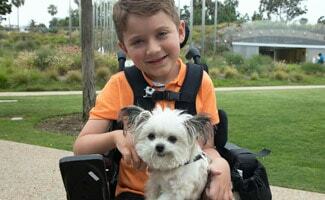 Watch this interview with Norbert’s parents Julie and Mark as they talk about how they met through him, some clips of Norbert volunteering at children’s hospitals and a sneak peek into his new book. Thanks Norbert for sharing your story! Do you follow @norbertthedog on Instagram? What do you love most about this little guy? 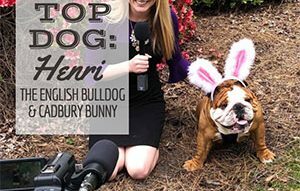 Read more Top Dog interviews to learn more about celebrity pup life.